Q. 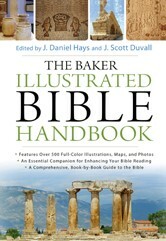 Where can I find the Baker Illustrated Bible Handbook? Through the Credo Reference database link on the library’s home page: search for Baker Illustrated Bible Handbook on either Credo’s main search page or the Find a Book tab. Through the Christian Studies and Religion LibGuide, go to the Reference Tools tab and find the Handbooks box on the left side of the page. For those of you who like to hold books in your hands, visit us in the library and use the print version from the Reference section. If you are off-campus, you will need to log-in using your OBU username and password. If you have questions about using or problems accessing this resource, please contact Kristi Smith, Circulation/Reference Librarian. You may also submit questions through the Ask A Librarian or Chat links on the Library’s home page or any of the LibGuides.